Did everyone watch the Super Bowl on Sunday? I was pretty uninvested in the game, so I dedicated most of my attention to the commercials, the half time show, and the game day food. Jenn organized our latest cooking competition, the Dip-Off. Pretty fitting for a football game right? There were so many delicious options. Some might even say TOO many (but I'm not one of those people). Sadly, I didn't win any awards* :( The 'Best Overall' prize went to Chris and his gumbo dip. 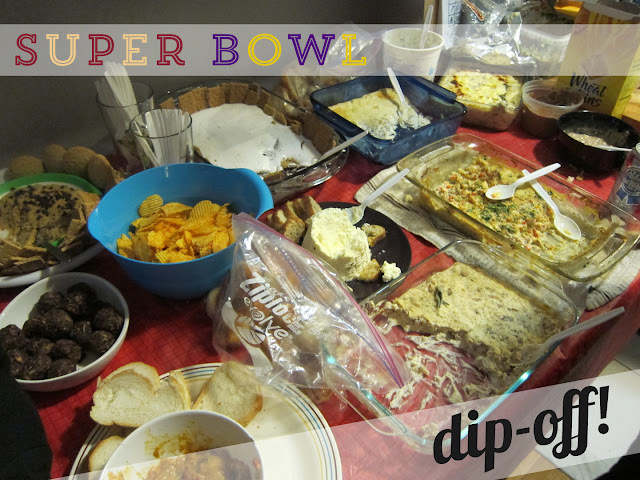 Liz took the 'Best Savory' category with her biscuits and sausage gravy dip. Kristin took home the 'Best Sweet' trophy for her s'mores dip. Hopefully Jenn will have some recipes posted soon! I contributed two dishes to the competition. Even though stacking my odds didn't win me any prizes, I thought they were pretty yummy options. 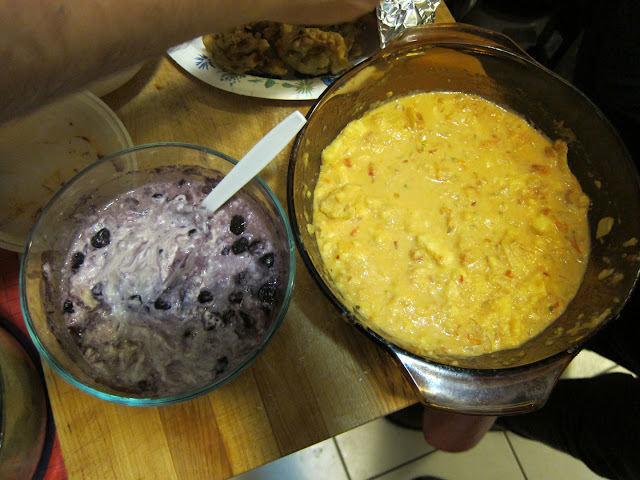 On the left is Hot Blueberry Cheddar Dip (via How Sweet it Is) and Chile Con Queso Dip (via vmac + cheese who adapted it from the Homesick Texan) is on the right. Talk about a cheese coma. And while I'm still rambling about the Super Bowl, my favorite commercial was the Budweiser Clydesdale story. I am my mother's daughter. There may have been a little tear in my eye by the end. I'm a major softy. Did you guys watch the game? What was your favorite part? I thought B did a great job. That voice? Those heels? That dancing? I need to step up my cardio about 100 times to keep up with that lady. The ___-Off competition is such a fun way to get friends together and eat lots of great food. We've done several in the past (like mac n cheese, pumpkin,lemon, beet, corn etc) and they are always a good time. Steal away! WOW i love that idea - a dip competition. these look yummy, cant wait to see more! The dip-off was great! People love a good competition (friendly, of course) so we got some really creative and delicious entries. Such a great idea I want recipes!